Veterans’ Day is a time to honor our country’s brave + selfless individuals who served in the United States Armed Forces, protecting the rights and freedoms of our beautiful country. We compiled a list of 5 of the most beautiful (+ lesser known) memorials to reflect + honor those who have protected America! Located near the Lincoln Memorial on the National Mall, this war memorial commemorates the sacrifices of 5.8 million Americans who served + fought in the Korean War. Often considered to be the “forgotten war”, the Korean War Veterans Memorial fights to give recognition by incorporating a mural wall displaying 2,400 photographs of the Korean War, a Pool of Remembrance, and a United Nations Wall, listing the 22 nations that contributed troops in the war. Most notably, the Korean War Veterans Memorial displays 19 stainless steel statues standing 7 feet tall, sculpted to represent “an ethnic cross section of America”. The lifelike statues look as if their ponchos are blowing in the Korean wind, separated by granite strips, modeled to represented Korean rice paddies. Formally known as the World War II Valor in the Pacific National Monument, the USS Arizona Memorial commemorates + honors the service people who lost their lives during the attack on Pearl Harbor which subsequently caused the entry of the United States into WWII. The monument preserves + retells the stories surrounding the war in the Pacific, spanning the experience of military personnel to the internment of Japanese Americans. Submerged under 40 feet of water, the USS Arizona remains where she fell on December 7, 1941. Today, the memorial is built on top of the original ship to memorialize the 2,341 sailors, soldiers, + marines who died because of the bombing. This monument stands to commemorate the arrival of George Washington + his Continental Army into Valley Forge, Pennsylvania during the Revolutionary War. Valley Forge functioned as the third of eight military encampments for the Continental Army’s main body. Modeled off of the Triumphal Arch of Titus in Rome (81 AD) which honors Emperor Titus’ capture of Jerusalem, the arch pays national tribute to George Washington in classical fashion. Sitting atop a hill in Valley Forge, the monument overlooks the 3,500 acres of protected land of the original encampment site. George Washington and his Army remained here for six months in 1777 and it is estimated that 1,700 to 2,000 soldiers died from disease + malnutrition. Located just north of the Reflecting Pool in the National Mall, the Vietnam Women’s Memorial commemorates the 265,000 American women who served in Vietnam as nurses, physicians, air traffic controllers, communication specialists, and intelligence officers. 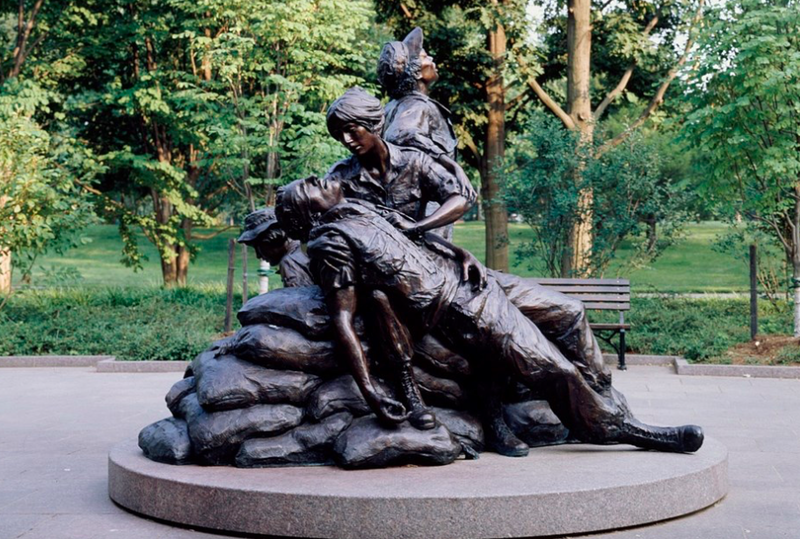 The monument depicts three uniformed women caring for a fallen soldier + serves as a reminder of the importance of women in conflict. The 2,000 pound bronze structure stands 15 feet tall and is located amid a grove of trees across from the Vietnam Veterans Memorial. This museum + memorial located in Kansas City, Missouri is dedicated to the preservation of artifacts, photos, and the memory of those who fought + died in the first World War. In 1919, the Liberty Memorial Association (LMA) + the citizens of Kansas City raised $2.5 million in just 10 days (equivalent to raising $34 million today) to build this memorial. It wasn’t until 2004 that is was designated as the country’s official World War I museum, and, only in 2014, did Congress recognize the museum and memorial as the National World War I Museum and Memorial. The memorial is constructed in classical Egyptian-Revival style as an obelisk, was completed in 1926, and was dedicated by President Calvin Coolidge in front of a crowd of more than 150,000 people. How do you recognize Veterans Day? Comment below!